While waiting for the Magento 2 release, we hoped that the new platform version would contain a reliable blog by default, but this didn’t happen. Luckily, extension providers were ready to close the gap between our desires and what we actually got. Due to such extensions as Amasty Blog Pro, Magento 2 blogs became available and now can be easily added to any ecommerce storefront. Below, we shed light on how this exact Magento 2 blog works. Social sharing simplifies user experience and allows promoting your ecommerce business on various social networks for free. 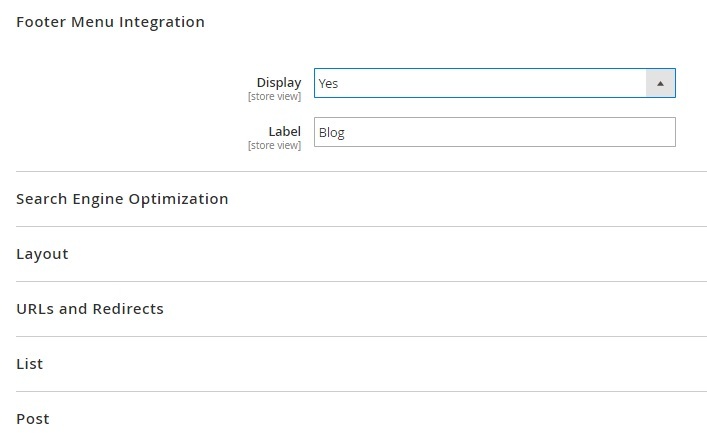 As you can see, Magento 2 blog integration won’t be painful if you choose Amasty Blog Pro. This Magento 2 blog module is designed to inform current and potential clients about the product, sales, promotions, and discounts in the most efficient way. Let’s describe each extension’s feature in more detail to find out all the privileges the tool provides. 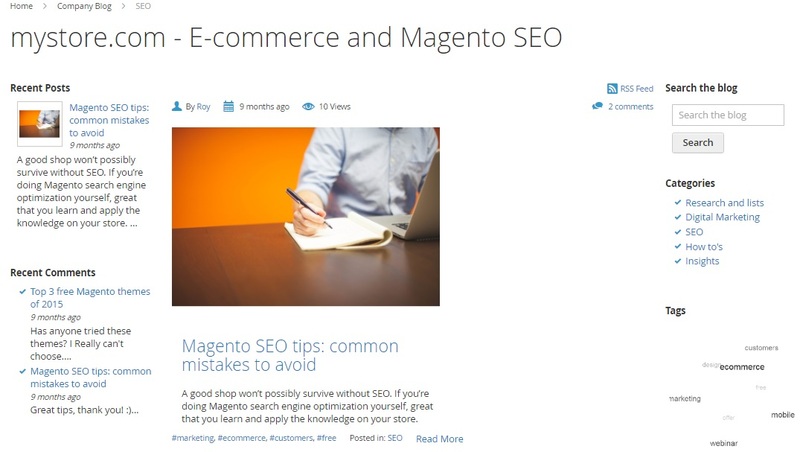 First of all, it is necessary to mention the responsive design of the Magento blog extension. The share of mobile commerce in ecommerce is continuously growing, and for some markets, it is already more than 50%. Therefore, lots of your current and potential customers are trying to reach your Magento 2 website from smartphones. If you don’t provide any optimized layout, you will lose all these people, because your competitor already offers a mobile-friendly interface. Luckily, the Amasty Blog Pro Magento 2 module is fully responsive, so you don’t have to be afraid of visitors who prefer to shop from small screens. All desktop and mobile devices are treated equally well by the Amasty’s Magento 2 blog module. In addition to the mentioned above mobile support, the Magento blog module also offers a highly customizable layout. It means that you can easily configure the appearance of your blog according to even the most strict requirements. The Amasty Blog Pro Magento 2 extension offers an intuitive constructor that allows arranging various blocks of each blog page. Besides, various general display options allow you to decide how many posts to display on a single page, choose the qty of recent posts in a blog, as well as fully configure your RSS feed and sitemap integration. Moreover, it is even possible to apply some design improvements, such as custom icon colors. A powerful 3D cloud of tags is among the extension’s features as well. As a Magento 2 administrator, you can change such its parameters as size, text color, and the overall color scheme. Thus, making tags visually appealing to store visitors is no longer a problem. As for the already mentioned social media integration, Amasty’s Magento 2 blog extension allows visitors not only to read interesting content but to share it on their social accounts in a matter of a few clicks. As a result, you promote your store on social media services and improve SEO (social sharing is a positive ranking factor). Note that sharing buttons can be added to all pages of the blog. 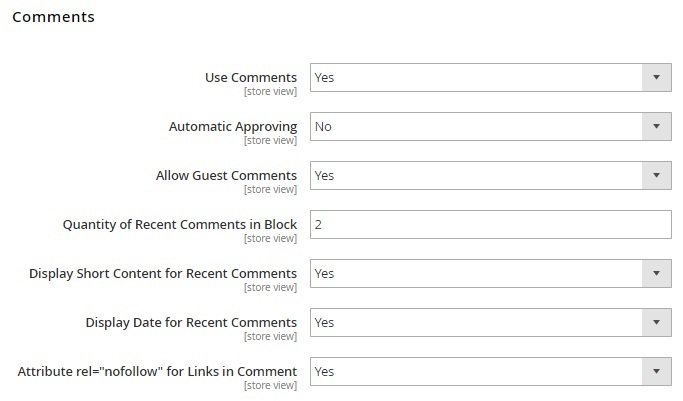 Advanced comments – you can enable/disable guest comments, automated comments approval, and email notifications. Besides, it is possible to moderate comments manually. Now let’s dive deep into the backend section to see how the mentioned features work on a practical level. Below, we explore various backend sections of the Amasty Blog Pro Magento 2 module. The configuration section is available under Stores -> Settings -> Configuration -> Amasty Extensions – > Amasty Blog. It is divided into 13 sub-sections: Footer Menu Integration, Search Engine Optimization, Layout, URLs and Redirects, List, Post, Comments, Recent Posts Block, Tags, RSS, Publisher Information, Social Buttons, and Look and Feel. In Footer Menu Integration, you can enable/disable the appearance of a link to your blog there, as well as type a label for it. 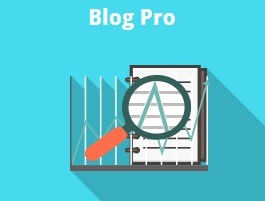 The SEO sub-section allows specifying such parameters as breadcrumb label, route, title prefix as well as meta title, keywords, and description for Blog Pro. Layout is a sub-section where you can arrange blocks with different blog information for mobile and desktop view separately. 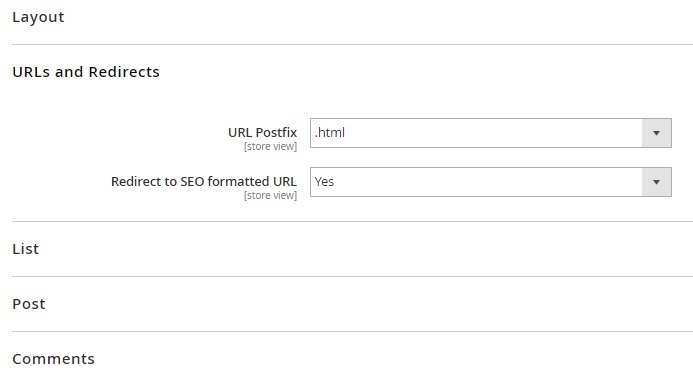 In URLs and Redirects, the Amasty Blog Pro Magento 2 extension provides the ability to select a URL postfix option (html or no postfix) and redirect visitors and search bots to an SEO friendly page using the 301 redirect. 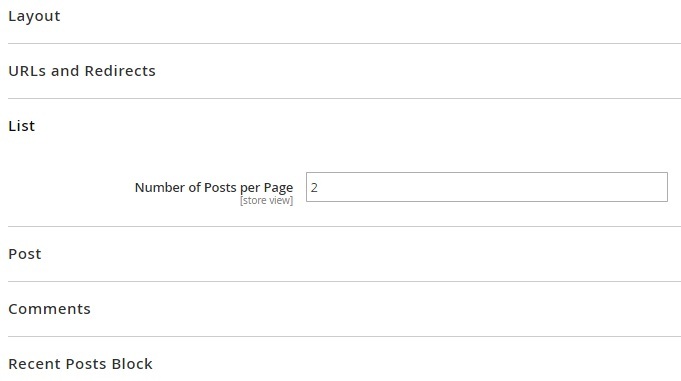 The List sub-section enables you to set the number of posts displayed per page. In Post, the Magento 2 blog module lets you show/hide such parameters as author name, number of views, print link, categories, and tags. Besides, it is possible to select a date format (X days ago or dd/mm/yyyy) and specify width and height of an image in the blog post. The Comments sub-section allows admins to enable/disable the usage of comments in a blog, automatic approving, and guest comments. You can also set the number of recent comments to be displayed, as well as activate such features as short content for recent comments, the date for recent comments, and rel=”nofollow” for links in comments. 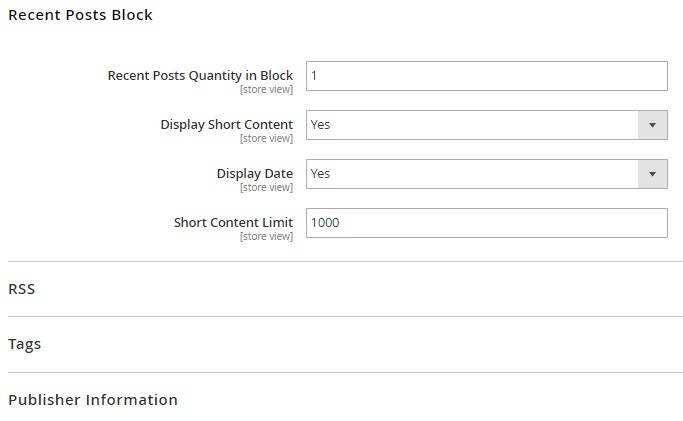 Recent Posts Block settings provide the ability to set the number of recent posts in the block, enable short content and display date, and set a limit on the number of symbols for short content. 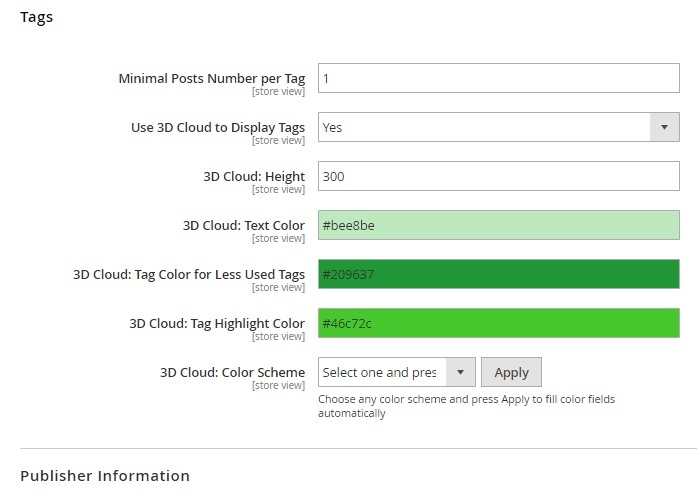 In Tags, you can set a minimal posts number per each tag, as well as enable 3D cloud of tags and specify its parameters: height, text color, tag color for less used tags, tag highlight color, and color scheme. The RSS sub-section lets to enable/disable the following parameters: link on list, post feed, category feed, and comment feed. 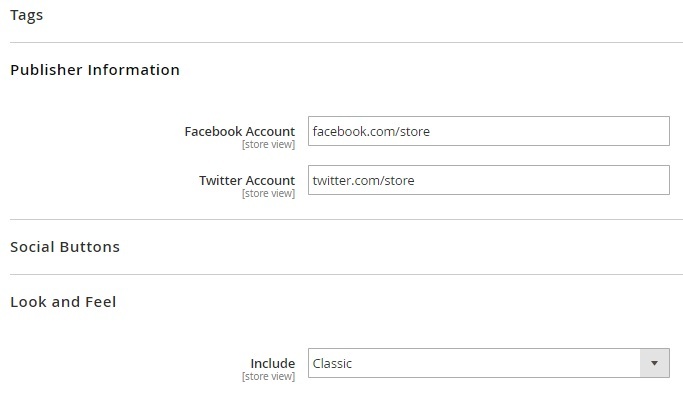 In Publisher Information, type corresponding Facebook and Twitter accounts. The Social Buttons sub-section allows enabling the social sharing feature and activate specific buttons. Press and hold CTRL to select several social networks. In Look and Feel, you can select a color scheme for the icons from the top of a blog post. 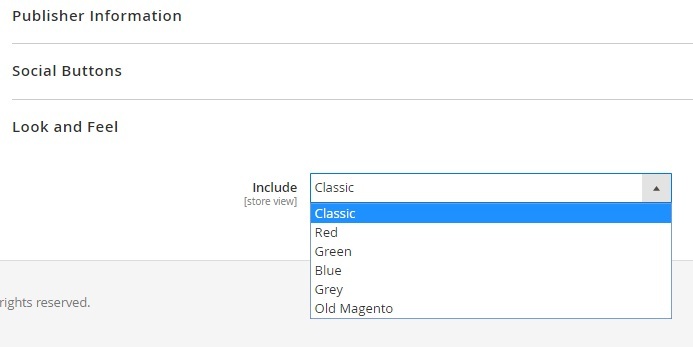 The available options are: Classic, Red, Green, Blue, Grey, Old Magento. This was almost endless configuration section of the Amasty Blog Pro Magento 2 extension. Although it seems to be a little bit complicated, you must admit that the module can be configured in accordance to even the most strict demands. So, what about other backend sections? A section with posts is available under Content -> Amasty Blog Pro -> Posts. All posts are gathered in a grid with filters for each column (except Store Views and Action) and mass actions: activate, inactivate, and delete. Besides, you can duplicate or edit each post from the Action column. While adding a new post, you have to deal with 5 tabs: Content, Thumbnail, Additional, Meta Data, and Statistics. Under the first one, type title and URL key, enable/disable short content, add full content (via WYSIWYG editor), select status (published, disabled, hidden, scheduled), and specify publish date. The Thumbnail tab allows you to upload post and list images and specify image link. Besides, there are three grid width options here: Normal, Middle, and Wide. 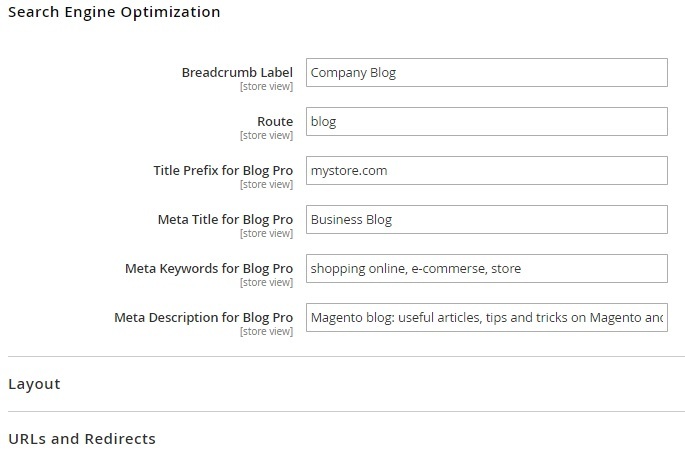 Under the Additional tab, the Amasty Blog Pro Magento 2 extension provides the ability to specify the name of the blog post author and his or her Google, Facebook, and Twitter profile links. 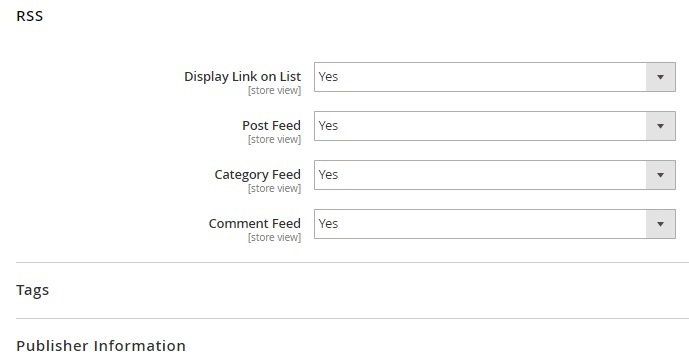 Besides, it is possible to select a store view from which the article is posted, select categories where to add it, and enable/disable comments. In Meta Data, specify meta title, tags, and description for the new post. The Statistics tab illustrates the number of views of the blog post. The availability of all these settings allows customizing post display as much as you need. Of course, there are more simple blogging solutions available in the ecosystem, but this one also has a very intuitive interface when it comes to the creation of new posts, despite there are lots of features that make Amasty Blog Pro one of the most robust tools of its kind. All categories are available under Content -> Amasty Blog Pro -> Categories. The grid allows you to edit each category. As for mass actions, they are: activate, inactivate, and delete. Let’s see how to add a new category. Hit the New Category button, and the Amasty Blog Pro Magento 2 module will redirect you to a new screen that contains two tabs: General and Meta Data. The first one allows you to type category name, URL key, and sort order. Next, you can enable/disable the category, as well as select a store view where it will be visible. As for the Meta Data tab, it allows specifying meta title, tags, and description. This part of the Magento 2 blog module was exceptionally easy, but there is one even more simple. A grid with tags is located under Content -> Amasty Blog Pro -> Tags. On the Tags grid page, you can delete tags in bulk, as well as edit each one manually. While editing or creating a new tag, you have to deal with three tabs: General, Meta Data, and Tagged Posts. The General tab allows typing tag name and URL key. In Meta Data, specify meta title, tags, and description. As for Tagged Posts, this tab contains the grid that illustrates all posts with the tag. As you can see, tag management is not a problem if you use Amasty Blog Pro, but what about comments? The appropriate section is available under Content -> Amasty Blog Pro -> Comments. Here you can approve, reject, reply to, edit, or delete each comment. Mass actions let to activate, inactivate, or delete comments in bulk. The grid displays such important information as post name, a short text of each comment, author name, status (pending, approved, or rejected), store view, time of creation and modification, and other details. 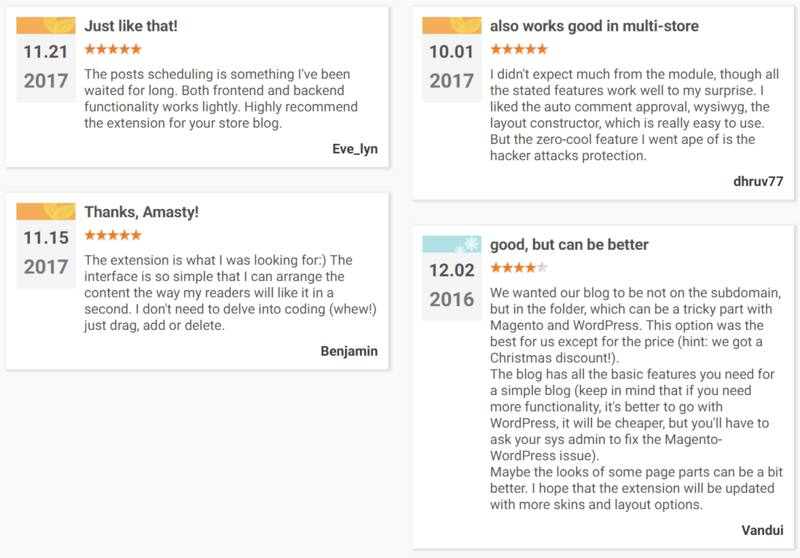 While editing a comment, the Amasty Blog Pro Magento 2 extension enables to change author’s name and email, as well as the text of the comment. Besides, you can change comment’s status and a store view from which it was posted. While replying to a comment, you should specify the same parameters: name, email, comment, status, and store view. These are core backend section settings that help to master the Magento 2 blog plugin by Amasty. Therefore, we can proceed to the frontend section. On the Frontend, Amasty Blog Pro has the following appearance. There is a section with recent posts on the top left. Below it, you can see recent comments. The central column contains posts. The following information is displayed for each article: author, date of publication, the number of views, title, short description, tags, and comments. The right part of the blog home page contains RSS feed button, search field and button, categories, and tags. Below you can see how the extension is integrated into the footer. All the elements mentioned above are available on each post page. At the same time, you can find a print button on the top right, as well as social buttons and comments below the article. Now the module is compliant with the latest GDPR EU requirements. Image size settings for blog pages were added. Thumbnails in posts are replaced with images from the gallery. “Published Date” column was added. A sitemap was added (for compatibility with the Amasty Google XML Sitemap extension).